Imagine that — you are a spectator in a medieval architectural arena, witnessing the harsh and fierce battle between two architects in the AEC field — the traditional winner HARD skills and his modern opponent SOFT skills. Facing the chaos around and the cheers of the bloodthirsty crowd, you weigh both rivals to make the mental bets in your head who will celebrate the victory. Hold on for a minute and consider wisely the proper outcome of this clash of skills. While Architecture is not the world’s oldest profession, its antiquity has never been cast in doubt — yet it has managed to always be a role that has continually evolved. Hence, the professional skills within it have endured significant developments since the year of practice. There are many whispers going around in the crowd regarding architects’ professional skills and which ones are essential. Let’s take a timeout here and first clarify the personalities of Mr. Hard skills and Mr. Soft skills. The first warrior — Mr. Hard Skills is a representative of functional skills. They are more about specific and concrete deliveries at the workplace that are easier to be objectively assessed such as initial building sketches, 3D model in a BIM software or scheduled project plan. He is always familiar with a wide range of technologies and methodologies of design, and understands the BIM software life cycle. His design experience is abundant, however he finds it hard to pitch his ideas to clients and direct his team during the implementation process. On the other hand, Mr. Soft Skills is all about communication and collaboration. He follows the philosophy HOW to solve the issues of the day in the architectural world is more important than anything else. He usually catches himself observing the behaviour of his project members and reacts based on his perception of the situation as there are different variables in each project. His team follows him faithfully as he always handles challenging situations as a real leader — taking responsibility, motivating and directing them throughout the hardships. It is harder to assess the work he does as it is related to more intangible tasks, which can be subjectively interpreted. The grand price of this battle is securing the project of designing the Olympic Medieval Campus. An honor given to few and a significant quest for professional development. Whom would you bet on considering odds? 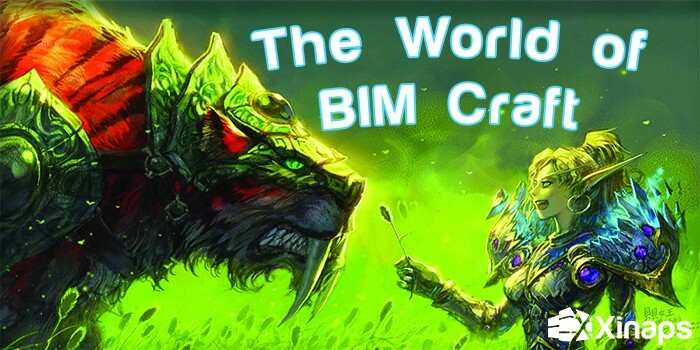 The war of BIM crafters is starting and one is surely going down. So are you betting on Mr. Hard Skills with his impressive 3D models in Revit®, where he embraces technology as a fountain of creative and innovative building designs? Maybe you want to join the new millennium approach where architecture as a profession thrives on the camaraderie of working on a team, building relationships with clients and striving to produce excellent work via collaboration — it is surely Mr. Soft skills philosophy. The gruesome battle begins and the clash of shields echoes through the arena. Retreat is not an option, so both opponents attack with wreak aggression. Facing chaos they focus on what can be controlled — the precision and excellence in every initiative of Mr. Hard skills is met with flexibility and critically observant resistance from Mr. Soft skills. They dance around each other, evaluating their strategies and trying to find the sweet weak spot of the rival. Seconds fly, minutes pass and the crowd becomes impatient and bloodthirsty. You would ask yourself, why is not the outcome an easy one — the strong beats the weak one!? You see, both Mr. Hard skills and Mr. Soft skills are experts in the AEC fields and their experience allows them to analyse the battle in a different way, which influences their decision on how to strike back. However, they both lack one significant skill — being able to predict their opponent’s next move as they rely only on their personal perception. The realization of this fact settles in their minds and the crowd sees the difference in their moves. It seems as if their fighting shoes have been swopped as Mr. Soft skills is more aggressive, but Mr. Hard skills adapts with ease to avoid the assaults. Both are on the verge of exhaustion and suddenly Mr. Soft skills drops his weapon. The crowd goes wild. Mr. Hard skills has the leverage and decides on the outcome of the battle. Will he be the architect who will design the Olympic Medieval Stadium? This feels like the pivotal point of the battle. Another weapon hits the ground not with the sound of defeat, but of an ultimate sound of epiphany. A hand extends towards Mr. Soft skills, which he takes with a knowing smile. There is a silent agreement, which forms an alliance with a simple handshake. In the aftermath the crowd wonders in silence what happened. They just were spectators of something extraordinary in the AEC industry — a traditionalist who isn’t afraid to zig when everyone is expecting him to zag. Many were looking with confusing gazes for a meaningful explanation. You see, Mr. Hard skills is a pretty smart guy — he knows his excellence and savvy knowledge in building design is exceptional. However, he realized during this dance of wills that there is more to it. Building design is also about the communication, adaptability and critical observation of situations. He can learn about these from Mr. Soft skills, who is an example of a BIM leader — solving problems, embracing change and not being afraid of failure. A wise man knows that the architect’s work goes beyond the technical skills and expertise. The art of adapting to change and collaborating with your team in a coherent and transparent manner is what lays as a foundations of great designs and remarkable buildings. Meanwhile, please welcome the future architects for the Olympic Medieval Stadium — Mr. Hard Skills and Mr. Soft skills. Delft, The Netherlands — June 2, 2016 — Xinaps is excited to announce that it becomes part of the leading tech incubator in Europe YES!Delft. Going strong, Xinaps continues to deliver innovative productivity tools for design professionals, one app at a time. 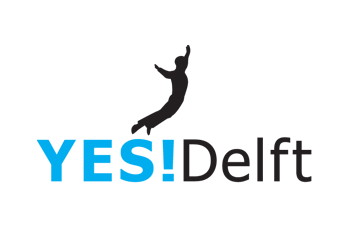 Xinaps celebrates joining YES!Delft tech incubation program. With the strong support of coaches and mentors, the innovative Dutch startup is well on the way to another successful year in the architectural industry. Being part of an inspiring, motivational environment can only catalyze the team’s ambition to deliver the next level of tools for analysis and visualization of 3D building models. With the help of coaches and mentors, the startup is ready to make the next steps in internationalization. More specifically, these include strengthening the presence in the UK AEC market and potentially setting foot in the US one. YES!Delft’s expertise and guidance will help validate the vision of Xinaps and communicate it to the wider audience. A step in that direction is an upcoming major event for the enthusiastic team of Xinaps. The startup will participate in Europe’s largest Revit® exhibition — RTC Porto in October 2016. More information about that will follow soon. As an architect Excel is probably your best friend in the workplace. But do you use it as an ally or are you too dependent on this tool? Don’t get the wrong idea, Excel is probably one of the most convenient software programs available today not only in architectural practices. It assists in manual checks, brings your data together and makes presenting easier with comprehensive visual charts. However, progress is unstoppable and the AEC industry is on the verge of a revolutionary change with the adopted building information modelling (BIM), which multilayered and consistent approach brings all project members together with coherent communication and information exchange. The reality of adaptation to new ways of designing a building always brings some tension and disputes. So do not start a love — hate relationship with Excel because it is rather a traditional tool, but learn how to incorporate and use it to your best advantage. 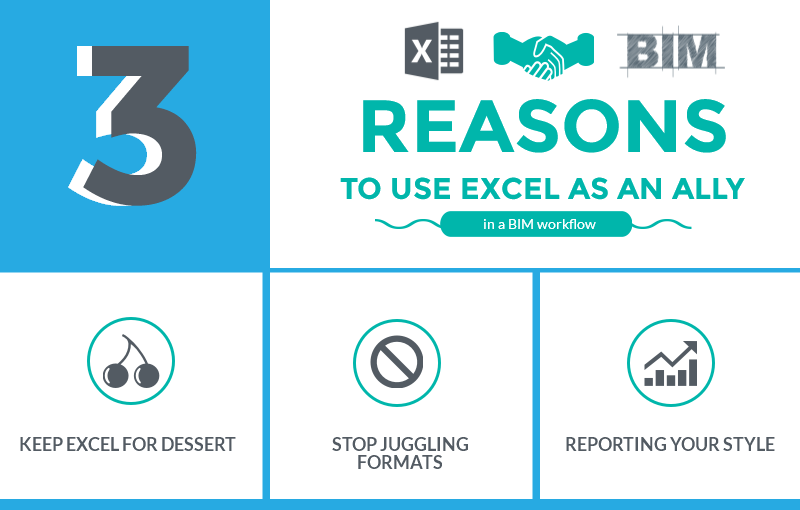 Here, we present you with 3 reasons why it’s time to let go of the unnecessary features in Excel that slow you down, and embrace the ones to help you get through the transition from manual to automatic BIM workflow. Starting at the preliminary design in the buildings lifecycle, it’s important to check, double-check and triple-check if the building design meets local regulations and standards. Call me old school, but to a large extent this is still being done in Excel — manually. Now you can surely use Excel, but leave for dessert. The smarter way you approach your building design process, the more efficient it will be. Without a doubt as a certified design professional, you don’t have the time to sit behind a computer for days or maybe weeks, manually counting and calculating whether the building has the right amount of plumbing fixtures, detail items and parking components. There is more than one BIM software nowadays, which automates the updates according to the latest changes in your design. For example, if you use Autodesk Revit®, you can simply add a plugin to do that for you. Have you heard of Xinaps Spatial Requirement Assistant™? The plugin does an automatic check in your 3D design and instantly adapts any changes within Revit® . So if you should simply set your template with rich data initially in a BIM software, which works in an automatic environment, where your data will be valid, credible and up-to-date with your design at any time. How does Excel come into the equation? Once you set up a template, you can easily export it to Excel to assist with administrative manners, presenting your pitch to the team and building owner and start building up the history of your current project in archives. So follow the KISS style by Keeping IT Short and Simple by making the choice at which stage of your building design process Excel is an ally. We all know that working on projects in the AEC industry always involves many team members, so you end up working with architects, engineers and contractors. They all need to do different calculations for the same designs, which is a premise to potential chaos and disputes. What if all of these calculations could be done in one software? ‘’If only’’, you would probably say. Using Excel as an assisting tool to present relevant and essential information to the whole team saves you the hassle to make sure your data is in the format that works with the software you use. No more frustrating converting the exported data and time-consuming complications. Let’s say that as an architect you want to have a budget estimation of costs and you use Financial Simulator™ plugin within Revit®. With the press of an Import button, your Excel data can be a part of your Revit® model. It adjusts automatically to any changes in design, so your financial feasibility of your building design can be monitored at any time by all the project team members. Even more, the Financial Simulator™ allows you to visualise any data in different chart and create comparative pricing scenarios for various design changes. Later on you can easily share all the updates with a colleague or your client by simply exporting an Excel file for your convenience and easier to read data at any time. As you already know by now, design changes are being made around-the-clock. Whether you are testing the visual light transmittance, window-to-floor ratio or net glazing area, it will still impact the decision-making process. This can be the tipping point to check if the building design meets requirements and local standards. You can easily now ensure consistency of reporting by creating your own style in Excel. Let’s say you want to check daylight requirements and local standards with Daylight Ratio Evaluator™ within Revit®. You will probably have specific technical jargon, which your team understands best. Don’t expand all your brainpower wondering how to inform all project members regarding your design decisions, but simply input your data fully in a BIM software by customizing your own template within it. Once you have a coming presentation or a team meeting, you easily export to a customized and up-to-date report in Excel, where later on you can add visual charts and tables to pitch your ideas in a credible and visually supported manner. 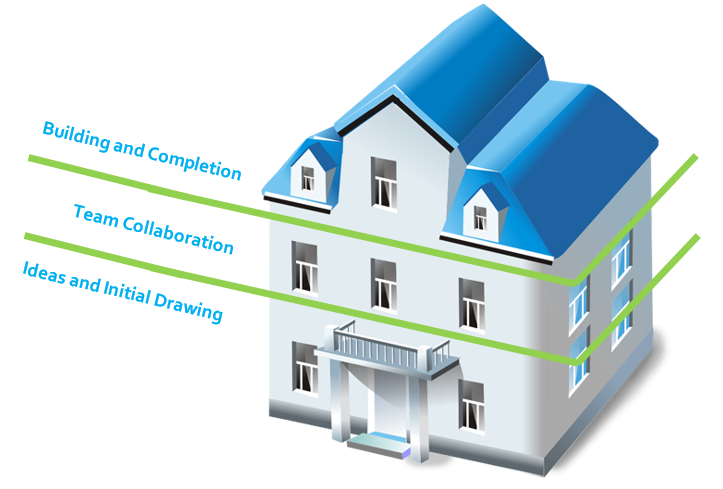 Revit® software is one way to go BIM with its abundant App Store, which provides plugins that ease your BIM workflow. Xinaps apps fully embrace the benefits of Excel and power them within Revit® by integrating it in your building design process. Want to know more about us and our products? Take a few minutes to look at our website and our corporate video. Share with us how you incorporate Excel into your design building process! 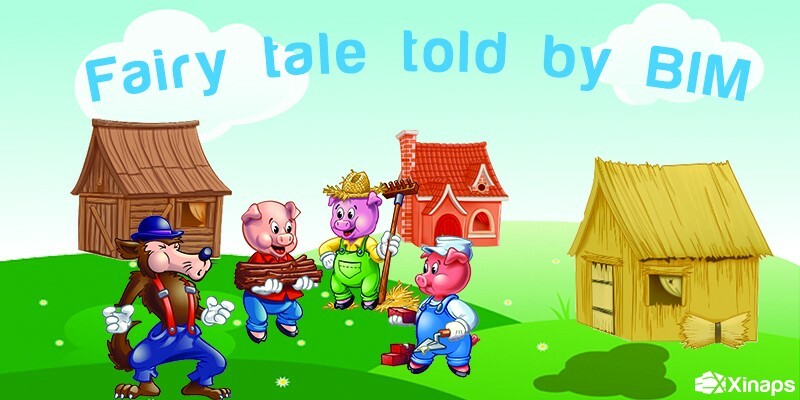 Everyone knows of the classic children’s tale of the three pigs and the wolf. It has been passed on for generations as a cautionary tale to work hard and smart because you never know when it might save your life! But this tale is not only for naughty little children. Oh no! This is a lesson that most of us can still learn from, if only we translate it to our situations, we might still learn a thing or two. … in a kingdom not so far away, there were three pigs who lived at home with their parents in Pigsville. Although they were brothers they could not be more different from each other. Their love for architecture was the only thing that united them. They could talk about buildings for ages, everything about structures fascinated them (even though they could argue about it every step of the way). Their passion drove them to apply and eventually graduate from PTU (Pig’s Technical University) with honors and a master degree in architecture. They made a pact that once they graduated, the brothers will build their own houses. However, there was one giant problem: The Big Bad Wolf. He was a creature from their wildest nightmares — ginormous with sharp teeth and razor-sharp claws, not only extremely ugly but also very cruel. Everyone spoke of him as the most unforgiving building assessor in town, who always left destruction in his wake. You see, The Big Bad Wolf had only one desire: to destroy all the houses in his way by finding the faults in them to get to the helpless pigs inside, a feat he always succeeded in one horrifying bite. The brothers knew they had to protect themselves against The Wolf by building a strong and sustainable house — this is where it became tricky. They could never agree on anything, especially on how to build a house. So off they went, their separate ways to assemble a team of experts that could help them in their quest to survive the Wolf’s wrath. They all found an engineer, a contractor, and they took on the role of architect (since they thought their design was the best) to build their dream house. 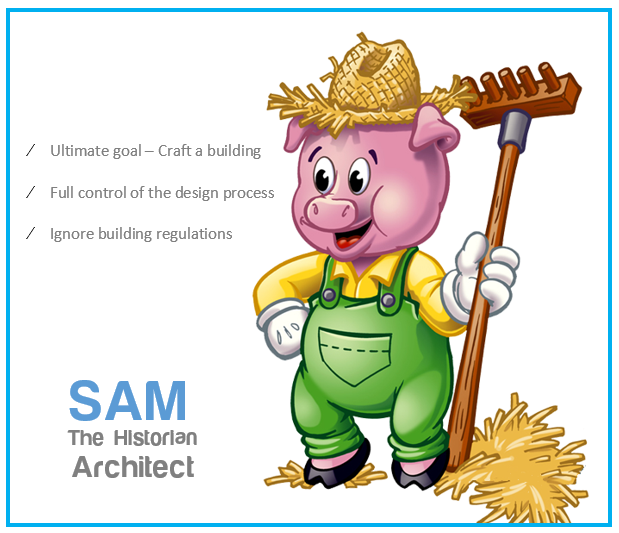 The first pig, Sam, was not the innovative type. He liked crafting much more and had a fondness for authentic buildings, made with vintage materials. His design was made of only straw held together with clay, which reflected his old-fashioned taste. He wasn’t a team player, doing everything from designing to building his house by himself. He did not take any regulations into account and just wanted to build something he would be proud of and was close to his heart. It looked like a mess but it was his hot mess. He promptly packed his bags and went to live in the house against everyone’s wishes. It took only a day before The Big Bad Wolf got wind of his poorly constructed home. The Wolf did not even need to strain himself — the house went down with just a soft huff of his destructive breath. Sam came running out of the house and fled to his brother’s house trying to escape. Meanwhile, Sam’s younger brother Ben had just finished building his house and had lived there for two days. He preferred doing things in the traditional way. But unlike Sam he was more than willing to work with different specialists. He wanted to build everything with wood and only wood. He came up with a beautiful design of a timeless wooden building, but there was one major problem. Collaboration. Everyone went on and made changes to his design without communicating and at the end, and it ended up to be a mess. And it showed big time. You could see glimpses of how the building needed to look like, but everything was a mix of conflicting styles and views. News traveled fast and The Wolf followed the scent of wood and juicy piglets to Ben’s house, where the pigs were hiding in a rickety corner by the back door. It took some effort, but with a couple of huffs and puffs The Wolf blew Ben’s house down. The house turned into a pile of old scrap wood. Mike was more than willing to provide his older brothers shelter and protect them of The Wolf. Contrary to his older brothers, he was very much a pig of the future. In Mike’s world change was not something to fear, but to embrace. He was always busy inventing new things and jumping on to new innovations. Mike wanted to build a house of the future, so he turned to computers. 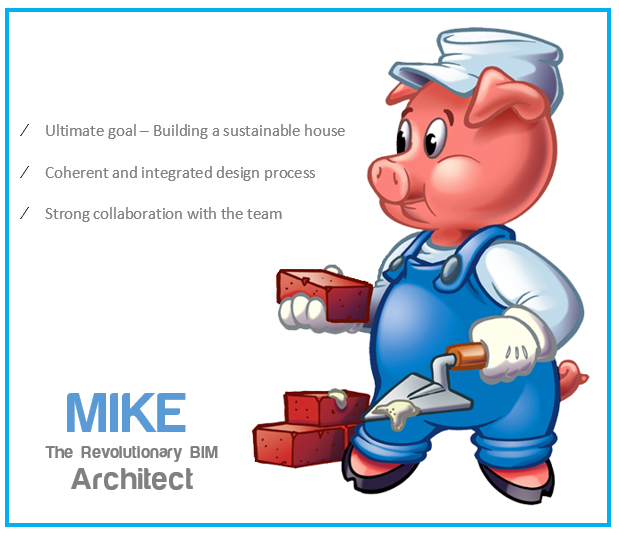 There a new trend in the AEC industry that inspired Mike — Building Information Modelling (BIM), which he wanted to use for his house design. He made his initial design in a BIM model with the use of Revit® software and additional plugins to optimize his designs. His contractor and engineer were all able to change the design, which updated automatically within the model. Mike was monitoring the planning and construction closely, but he never ceased collaborating with the team. The smooth collaboration and integration of BIM in the design process helped him to do all the work in half the time and build a modern and futuristic house he could be proud of. Even Sam and Ben were surprised to see all the work he was able to do in such a short amount of time. The Wolf was sure he could finally catch all the pig brothers for good with no effort as they had nowhere to run. He tried huffing and puffing, but the concrete building would not come down — it still stood tall and unyielding. No matter what The Big Bad Wolf did; the house would not budge. After hours and hours of effort he finally collapsed and passed out from all the strain and power he wasted. The local Pigsville’s police arrested the drained Wolf and the kingdom was forever in Mike’s debt. The whole kingdom was renovated accordingly to Mike’s adopted BIM vision and he allowed his brothers to join his blossoming architectural practice. You are now probably wondering what this has to do with you as an architect. The main moral of the story is striving to work smarter and easing your workload through collaboration with your team. Your efforts in showing priority and valuing build quality will always pay off. At the end of the day, building consensus, reinforcing innovative ideas, and the need for sustainable design will always be cherished. Whether you’re an established or freshly graduated architect, all great professional designers of buildings care about three main things. Have you ever put together a large jigsaw puzzle with a lot of pieces? At least one puzzle piece is always difficult to place. It isn’t a corner puzzle piece, but one of the middle ones that looks too similar to the others to stand out, but is still unique. Every professional represents this different piece as they have their personal perception of the value they add as an expert in their industry. Architects are no exception to the rule. It spurred our curiosity. Therefore, we made a brief research to find out what people in the AEC industry care about. There may be some surprises for you, there may be none! Keep reading and find out if you value the same things. Architects design buildings for people, so they need to understand what comfort and quality represent for an occupant in order to deliver an excellent drawing. When you start sketching the building, you input your creativity and knowledge, hoping the client will be happy. ‘’Is the visual representation innovative and modern enough?’’, you quietly ask yourself. As in many industries, a draftsman starts with trying to figure out all the desirable elements for the building owner, but also the future occupant. Many believe architects are very straightforward-minded and analytical, which is not untrue. However, they also use psychology to conduct research on a behavioural level of what people would imagine a great building can be. So how do you approach your client? Empathy is an interesting way to connect emotionally to the value of a project. Feeling what others feel gives us deep insight into what they need. Art and drama thrive on empathetic design techniques, and they form your design intuition in architecture. For example, let’s say a design professional manages to understand the client’s requirements on a higher emotional level. Why they want specific building design and why they decided to build this site? The chance to actually illustrate the building in an appealing and attractive way from your first draft is higher, don’t you agree? Imagine yourself as the living occupant, so you can have the motivation to enhance design towards comfort. Thankfully, we all have cosy homes, so we know what increases our sense of content and convenience. Is it more windows, so the rooms feel spacious, open and light? Or is it how you access in the easiest way the parking — with elevators or stairs. It all starts with understanding the needs of the people for whom buildings are created and your own objectives for the project. Architecture is an art for professionals, who want to provide to others unique and safe environment with their buildings. While caring about people motivates to create sustainable and feasible buildings, a sense of unique design inspires outstanding and vibrant ideas with a breath of innovation. Do you challenge yourself to take the transformational building elements into new and exciting realms as a design professional? The very purpose of innovation in building design is to disturb and challenge the status quo and make a difference. It is more than presenting the next exceptional 3D drawing with extraordinary design, you should think ahead about the ‘’how’’ to turn the ink from the paper to a skyscraper. It is a whole journey for your team to achieve the tipping point when you can state your building designs are innovative. You need to create a climate for innovation in the whole BIM workflow in sync with all the participants in the process. Think of it as a three-storey house. You enter the ground floor, where your ideas create chaos, but you go through it, looking for the ‘’ big one’’ — some are absurd, others — crazy, the rest are creative. Then you go through the daunting process of decision-making where you choose one challenging, but potentially innovative design. Some days of 3D drawing in Revit® follow, but at the end you are satisfied with your preliminary design. Then taking the stairs you go to the first floor of the house, where you find your team. 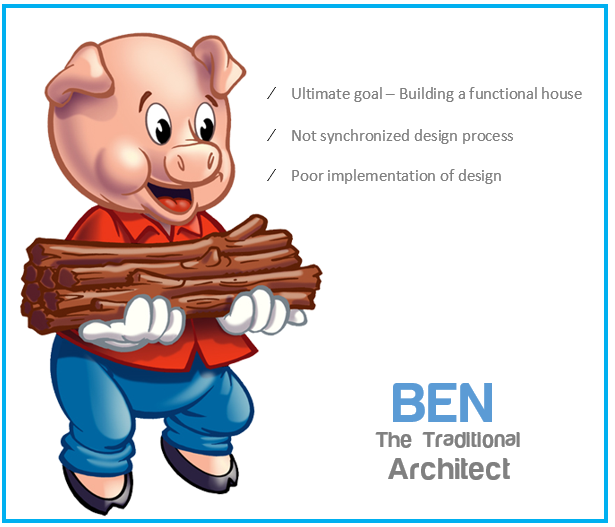 You are very aware the designing process of the building is about people, so your BIM team is essential. There are experts with various backgrounds — engineers, facility managers, asset manager and of course the building owner. Now you simply need to convince them why your design is feasible. Also, how they can bring their expertise into the table of discussion to achieve innovation. It is not only about the latest technical advances that you are going to use. It is also about the internal collaboration of all the professionals. Furthermore, their contribution to the feasibility of the final design drawings. At the second floor, you find yourself in the construction phase, where you transform your final drawings and plans into reality on the real-setting building site. All the information exchange and scheduling of tasks is created in a coherent multilayered system, in which you work together with your team. And Voilà! You have just created an innovative architectural piece by sustaining the mix of the right professionals and incorporating of technical advance in the construction of the building site. Every person wakes up each day with the hope of a better future. Your building designs should be a representation of the path to that future. As an architect, you need to ensure you make mindful choices, not arbitrary ones. The creative solutions regarding your projects need to be well-reasoned, as it all has a reflection on the build quality. We believe you should pursue the art of building, but minimize the negative environmental impact of buildings throughout the project. Nowadays, architects should ensure sustainability. The ecological design emphasizes the importance of long-term and durable buildings. Build consensus, reinforce innovative ideas, and underscore the need for sustainable design. Why not embrace this as your new professional motto? The architect’s utmost priority should be to create cutting-edge solutions that boost quality while saving resources, time and effort. Once the idea of durability in your drawings is projected, you establish a process to create visually-stunning, cost-effective and sustainable buildings, but with the decision to prevent the environment and not to inhibit the opportunities of future generations. Great designers care about people as a source of inspiration, innovation in design and the sustainable future. At Xinaps we believe that developing smart building checking tools within design software can simplify and optimize the building design process. Hand in hand with experts from the AEC industry, we work hard on shaping innovative architectural tools right within Revit®. How do you feel about this list? 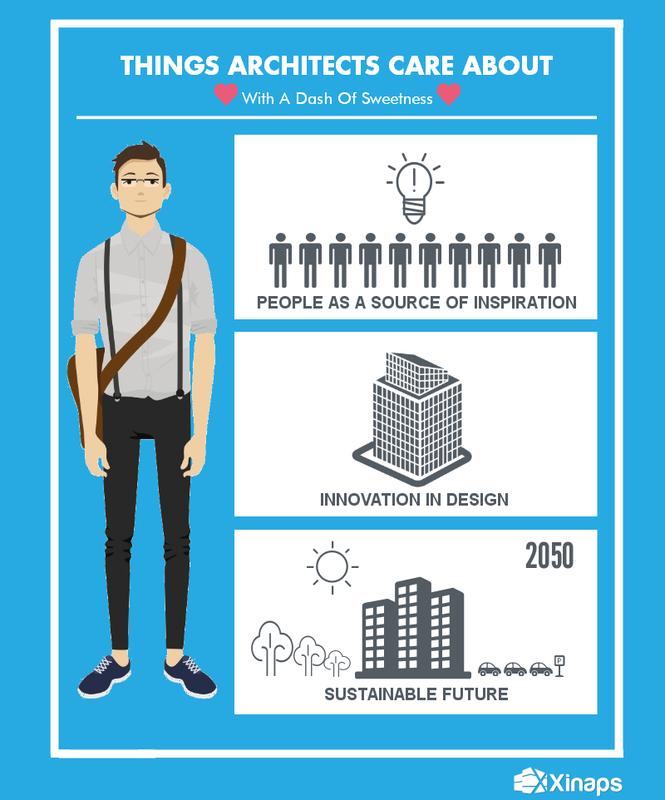 Sharing is caring, so feel free to tell us what you value as an architect. We know we care about enriching design solutions for AEC professionals! 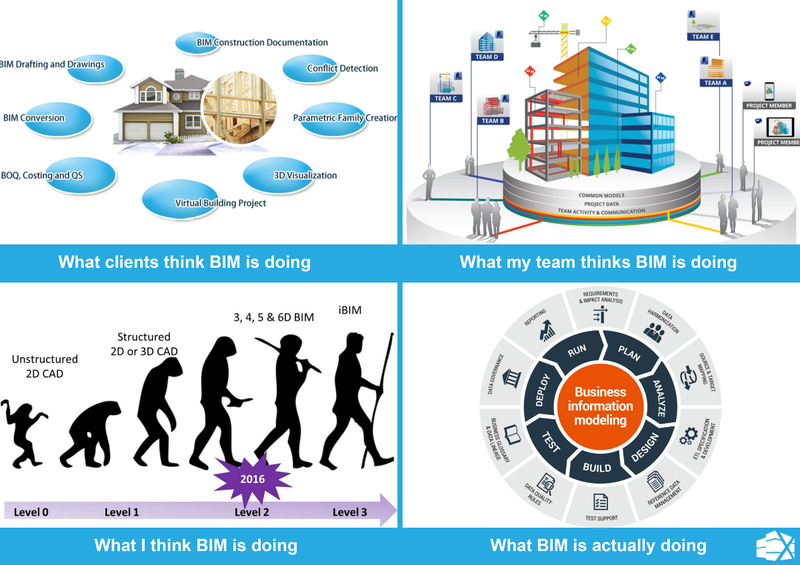 What are you actually doing with BIM? Is the cat out of the bag or you still haven’t decided to adopt the building information modelling (BIM) approach in the last few years? The concept has been around since the 1970’s, but its adoption has increased recently and challenged design professionals in the architectural practices. For many companies, it is a daunting challenge to adapt to changes and reinvent their process into more efficient and productive one. 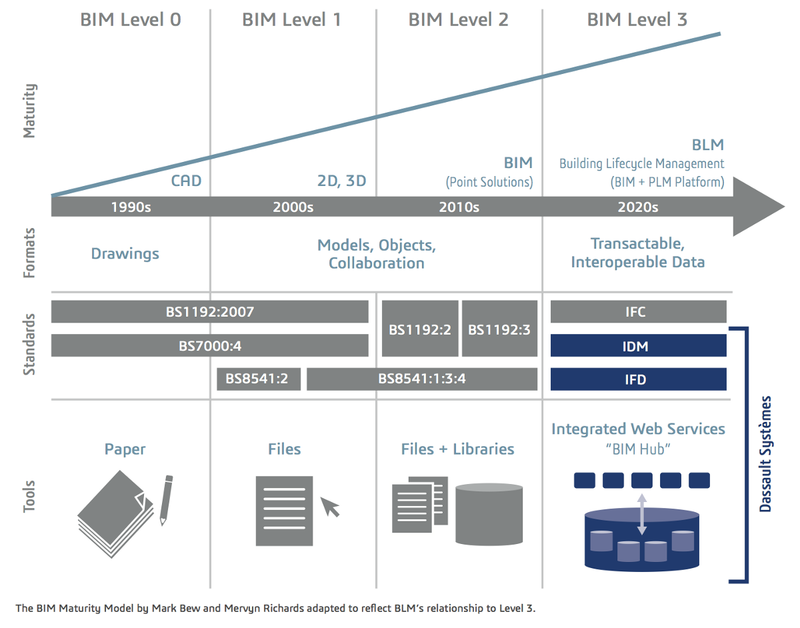 Some experts forget BIM is not just a temporary hype that will slowly die out. It is a whole new process, which has been made a global industry standard by governments. The common question of ‘’Do you use BIM?’’ is irrelevant after the changes in the economic landscape required more optimized and efficient approach towards design in the AEC industry. The difficulty for architects is not only that they need to adapt to these fast-paced shifts, but also the hardship of replacing traditional methods of drawing a building. Furthermore, familiarizing with the team interaction within the BIM workflow. You can’t just purchase it online and learn how it works by watching YouTube videos. Also, it takes teamwork, 3D software, extra tools and proper training to make feasible and BIM-applicable designs of your building. New projects always come along with different requirements. Either the client or the local authorities have high expectations of the overall process of implementation regarding building standards and sustainable design. BIM allows all the parties — architects, consultants, contractors and building owners — to work simultaneously using the same access to information. So what will your role be as an architect in this diversity of experts? The asset manager will lay the first challenge of the many. As an architect, you are asked to integrate financial analysis into concept stage and ensure the feasibility of the project. The future property/facility manager does not ease your responsibilities. You are expected to establish practical processes for future building maintenance to be easy and accessible. Future occupants also set various expectations to guarantee the building’s functionality, comfort, and quality. Furthermore, you need to consider all occupants’ senses — light, temperature, space, accessibility and attractive look&feel design. You are in a bind of expectations and reality when designing a building. It involves a lot of everything — think of keywords such as communication, automation and efficiency. The perks in BIM-tailored software are that all teams can track each other’s changes, shorten feedback loops and save time, while reducing errors and omissions of information. The collaboration between different teams and the building owner, while working altogether on building designs and plans, is more productive and effective because of the transparent communication channels. So where to look for similar software? Exchange Store of Autodesk Revit® is one way to go. It is a representation of heaven for the users as it opens a door to extensive collection of plugins, which automatically adapt to the latest changes of design. Imagine being able to reduce overall project duration and generate error-free, high quality construction documents with a few clicks. This is all thanks to the BIM process that helps your designs to blossom. The building process is challenging from inception to completion. No project is ever the same, which is a continuous learning experience for design professionals. The diversity BIM brings is that you will be able to work with many team members on one project, who are like-minded experts. However, there are some precautions, which should be taken in consideration to ensure easy and transparent communication. So how can you direct the interaction to achieve the golden balance? The implementation of BIM helps to bring architects closer to the asset manager, contractor, specialist subcontractors and the building owner. It is as a small family, where each member has their quirks and strengths. The client might come to you for advice on occupant preference. The civil engineer might ask for pointers for HVAC design. The contractor might want you to help him build quality and regulations for sustainability. In the end, it comes down to juggling all these teams. Take CARE (Connectedness — Authenticity — Recognition — Engagement) for all participants in the process and create a coherent environment. Mind you that the architect sets the foundation of the process in preliminary design with the drawing of the building and uses channels of communication to distribute it. One needs to underline that the BIM model allows all the latest changes to be automatically updated and synchronized with the design. It is not a one man show, so the information is equally important for everyone. It is vital to adapt plans, deadlines and checks to alterations. Be a TEAM because Together Everyone Achieves More. 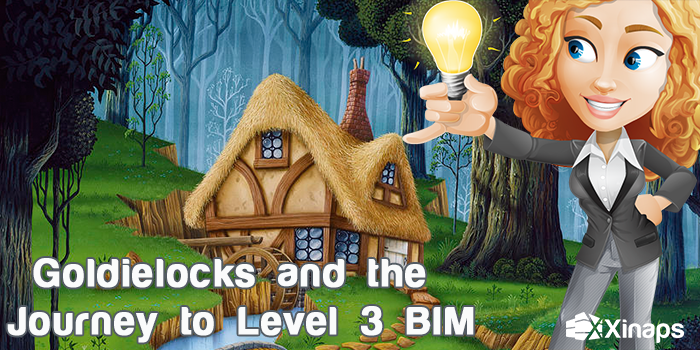 In the beginning, you’ll have absolutely no clue how to even approach BIM. However, once you will familiarize yourself, it will open up a whole world of information and opportunities to enhance your 3D drawings and building’s design. You can really bring your building structure to life and take the transformational building elements into new realms. First, you need to familiarize yourself with the building information modelling approach and understand how to use it to your advantage. For example, a 3D building information model provides excellent visualization of space. When that model illustrates the phases of construction over time, it becomes 4D (3D + time). The advance of this process is fast and substantial as architects are ‘’talking’’ 5D, 6D and 7D, which opens a whole new universe of dimensions. 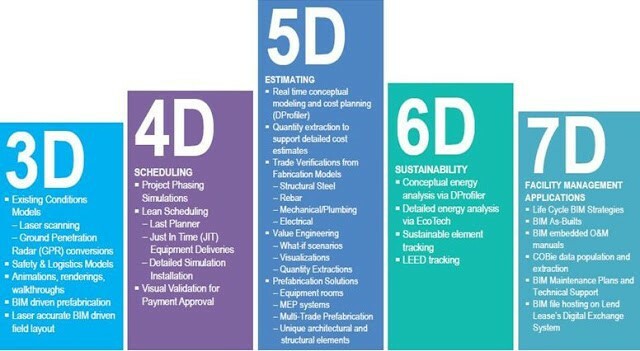 Second, take into consideration that the amount of rich information BIM makes available can help you throughout the entire lifecycle of the building process. Design professionals can actually manage to do all of the above using BIM as it is a multilayered complex system, which incorporates all the tasks. It gives you the opportunity to run an extra mile in your project. Furthermore, is allows saving time and reducing unnecessary costs because of the latest changes in design. Imagine the whole process as a circular motion. From the internal collaboration between teams to the completed external presentation of the building site. What if you are able to optimize and ease your workflow at the very beginning — from the briefing of your client, through the preliminary design stage with clear costs estimates, to the construction period for the building and its operation and maintenance considerations. All the chaos of scheduling, task planning, documentation, logistics and construction is nipped in the bud. One needs to fully incorporate all these activities in a consistent, controlled and directed process. You are not involved in a constant hassle of endless manual rechecks. Also, neither in coming deadlines and disturbed communication channels between all the parties anymore. 3D drawing allows a new level of precision, you can look into each building component and analyze it individually. This gives you the freedom to go deeper into details and surprise with outstanding building drawings. It’s like you get a super power that will allow you to draw exactly what your creative mastermind imagines, but with the composure you can instantly check to make sure your design is structurally possible and feasible. BIM not only helps you to detect any design flaws in concept stage, but it also broadens your spectrum of possible innovative solutions. Architects design vibrant and innovative buildings that push the boundaries of creativity. Contractors work faster with an insurance to build quality and commitment to sustainability. Building owners reduce cost. They control the workflow from concept to completion, have the clarity of the pay-off time and return-on-investment of their building. Facility managers identify maintenance requirements with just a few keystrokes. You don’t need to pinch yourself — this is not a dream. It’s the promise and potential that BIM brings — embrace it and enhance your creativity. https://xinaps.com/wp-content/uploads/2017/02/wp9.jpg 363 591 admin https://xinaps.com/wp-content/uploads/2019/03/Xinaps-horizontal-Blue-logo-website.png admin2016-04-07 14:14:332017-03-29 10:54:06What are you actually doing with BIM? Delft, the Netherlands — February 3rd, 2016 — Vabi Software International today announced its name change to Xinaps. After an eventful year on the international market, the forward-thinking Dutch startup changes its name to match more closely with its core values and goals. The innovative team of Xinaps continues with full force the development of quick, easy-to-use and reliable building model checking plugins for architects who use Revit®. It was originally founded as a spin-off of the Dutch Vabi Software. Therefore, Xinaps inherited the methodology of the renowned on the Dutch market building simulation modelling company. Since its foundation in 2015, Xinaps has already launched 5 apps, plugged into Revit® and fully up-to-date with the latest drawings. In addition, with lots of perspiration and determination, the team has promised to deliver 2 game-changing apps and lots of desired upgrades in 2016.